Please note: We don't extract any ZIP, TAR and other archives. This version of Website Antivirus works across all platforms. Doesn't matter what CMS you are using for your website. Or even if you don't use CMS at all. Our solution is suitable for you. Care about security and reputation of your website? Get the benefits of Website Antivirus PRO version today. 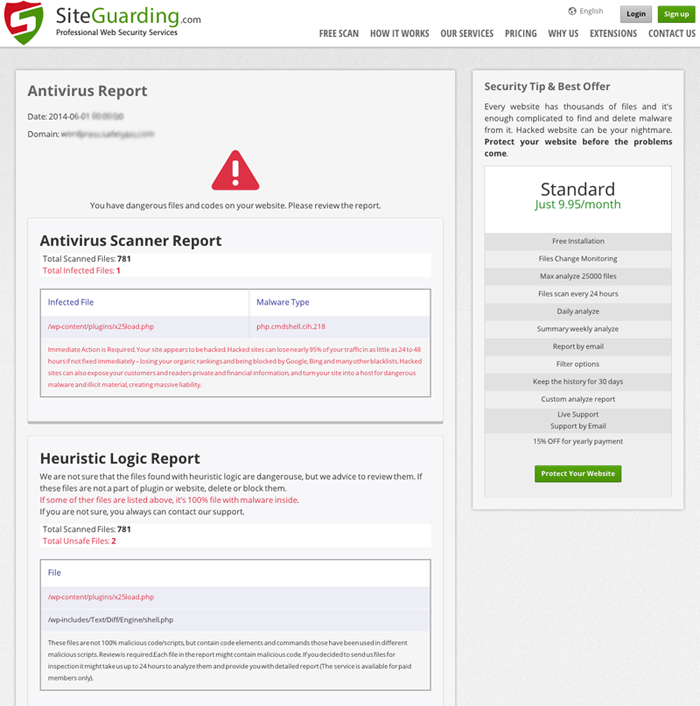 Over 100 thousand website owners rely on SiteGuarding Antivirus Website Protection to keep their websites safe. Subscribe to PRO version and get all benefits of absolute security. Remember: Protecting today, securing the future. Every website needs protection. Even if your website does not have a lot of traffic it can be attacked by hackers. Our website antivirus helps you keep your website secure by identifying weaknesses that a hacker can use to get access to your administrator's panel or infect your visitors with spyware and viruses. We take website security seriously. Every day our antivirus helps hundreds of website owners to remove backdoors and malware from their websites. Our product uses absolutely unique heuristic algorithm to detect Backdoors, Viruses, PHP Mailers, Redirects, rootkids and etc. Even if the virus is not in our database our antivirus can detect it by analyzing file's code. Every day we get reports from our customers all over the world. Our engineers analyze each infected file our customer's sent to us - this is what makes our product unique. We receive infected files form thousands of people from all over the world and every day we add them to our databases. Absolutely unique antivirus solution for your website. Possible to use on any CMS and any website. Daily cron feature (automatically daily scanning of your website). Strong and unique Heuristic algorithm to detect unknown viruses. Professional support from our security experts. With PRO version you have option to send the files for deeper analysis. Our experts can analyze any malicious code. Deep scan of every file. We scan every single file on your server, database tables. Our unique heuristic algorithms detect more than other antivirus solutions. Every website has thousands of files and our antivirus can narrow analyze range of the files for webmasters and website owners. No problem. We have 14 days trial. Simply register on our website. Install our CMS extension (if you use WordPress, Joomla etc), or just add your website in your account and enjoy all the features of our product.